Odor Blanket | Pro Chem, Inc. 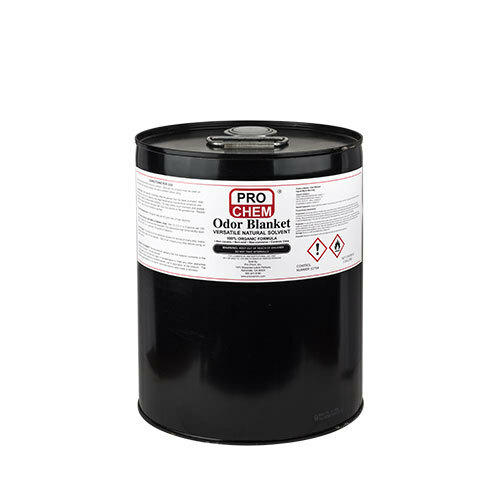 ODOR BLANKET is a versatile product that can be used as a grease trap and lift station maintainer as well as an energizer to improve the effectiveness of acid drain solvents. 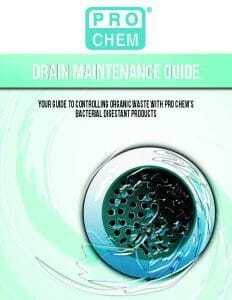 It works with sulfuric acid in the removal of blockages in drains, toilets, grease traps, cesspools and septic tanks while blocking the foul sulfuric acid odors from escaping from the drain. This product is intended for use as a compound in drain lines and/or sewage systems in areas of official establishments operating under the Federal meat, poultry, shell egg grading and egg products inspection programs where there is no possibility of food contact in food processing and food handling establishments. Grease Traps: Start treatment immediately after the grease trap has been pumped. Add one quart per cubic foot of capacity then begin preventative maintenance schedule one week later. Repeat procedure after pumping. For traps where scum blankets and grease cakes have already formed add one gallon per cubic foot directly to the grease trap. Repeat every 3-4 days until scum blanket is liquefied. Preventative Maintenance: One gallon daily per 40 cubic feet of trap capacity. For Pumping Stations, Wet Wells, and Sewer Lines: Add 1-5% (1-5 gallons per 100 gallon capacity) by volume as initial treatment. For preventive maintenance (daily application), use 0.25% (1 quart per 100 gallons of capacity). Solvent Cleaner: This product is a nonpetroleum solvent for removal of many inks, resins, ester gums, alkyd resins, tar and asphalt. Test in an inconspicuous area first.